Despite its foreboding name, Dead Horse Ranch State Park (928-634-5283, azstateparks.com/Parks/DEHO/) is a pleasant place to visit. The unfortunate moniker comes from the Ireys family who came west in search of a better life in the 1940s. After several days of hunting for the perfect ranch, Mr. Ireys asked his kids which place they liked best. The children excitedly replied, “The one with the dead horse in front of it, dad.” And with that response, the family found a new home, and subsequently renamed it to mark the momentous occasion. Thirty years later, when Arizona State Parks acquired the parcel, retention of the colorful name was a condition of the sale. Today there’s nary a dead horse in sight at this northern Arizona State Park that’s located 30 miles southwest of Sedona in rural Cottonwood. Instead you’ll find 423 acres filled with accessible trails, fishing and birding opportunities, and comfortable camping cabins. The park is a prime birding spot in the spring and fall, and the headquarters for the Verde Valley Birding & Nature Festival in late April. A word of warning though — it’s too hot for birds or humans during the stifling summer months, so plan your visit accordingly. On the plus side, 180 bird species have been spotted in the park during the prime seasons, including loons, herons, egrets, eagles, hawks, hummingbirds, kingfishers, swallows and ducks. The best place to get a glance of the avian residents is on the Canopy Trail, which begins in the day use area. Accessible parking is located near the trailhead, and although it’s a short walk from the cabins, there are stairs and other obstacles along the way, so it’s best to drive. The quarter-mile wheelchair-accessible trail has a hard-packed dirt surface and is covered in crushed granite. The wide level trail winds under a cottonwood canopy, so there’s also plenty of shade along the way. There are even a few cement sections, and the whole trail is designated as a “smoke-free and herbicide-free zone” to accommodate people with multiple chemical sensitivity. About half-way along the loop there’s a picnic table and a large collection of chairs under an enormous cottonwood tree. There are also a number of hummingbird feeders in the area, so it’s the ideal place to just sit back and wait for the birds to appear. And if you’d like to pack along a picnic lunch, there are also sheltered picnic tables on a cement pad near the accessible restrooms in the parking lot. Another must-see in the park are the three lagoons located near the end of the main park road. Filled with water from the Verde River, these lagoons are stocked with catfish and trout, and feature accessible trails around them. The trail around the west lagoon is a third-mile long, while the trail around the middle lagoon measures nearly a half-mile. And if you’d prefer a three-quarter mile scenic stroll, then the trail around the east lagoon is just what the doctor ordered. There’s plenty of accessible parking around all of the lagoons, with barrier-free access to the lagoon trails, which also act as levees. The trails are wide, level and composed of hard-packed dirt, and they are shaded by the trees along the shore. There are also several accessible fishing piers on each lagoon, that offer roll-on access and lowered rails. Additionally if you’d like a longer walk, the trails connect, so you can plan a round-trip hike around all three lagoons. 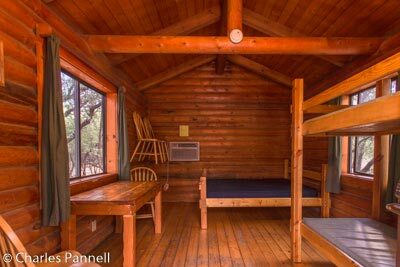 If you’d like to spend the night in the park, the camping cabins are a very accessible and affordable choice. Priced at $55 per night, they are pretty basic, but a definite step up from pitching a tent. Cabin 1 (also known as Antelope) has a paved parking area in front, with level access up to the front porch. There’s is a wide doorway and adequate wheelchair clearance inside the cabin. It’s furnished with a set of bunk beds and a double bed, a chest of drawers, a table and four chairs. The bunk bed is 17 inches high, while the double bed is 23 inches high; and they both offer wheelchair access on one side. Additionally, the chairs can be easily stowed on hooks when not in use, which frees up more floor space. The cabin also has electricity, overhead lights and an air conditioner. Outside there’s a picnic table on a level grassy area next to the cabin. There is also a fire grill near the table, and a bench on the porch. None of the furniture can be removed from the cabin, so it’s a good idea to bring along some lawn chairs for additional outdoor seating. There are three other accessible cabins, including cabin 2 (Bobcat), cabin 5 (Eagle) and cabin 8 (Hawk). They all have the same configuration as cabin 1, but cabin 5 offers the most privacy. The bathhouse is located a short walk away along the paved road. The large family restroom includes a roll-in shower with a fold-down shower bench and grab bars. The shower is large, and the bench is four-feet from the shower faucet, so this setup is best for someone who has their own shower chair or has an assistant. There’s no hand-held showerhead, and as a water conservation measure, a one-to-two minute water spurt is released when the shower knob is pressed. It can be pressed with a fist, and although it seems inconvenient, at least it’s free. 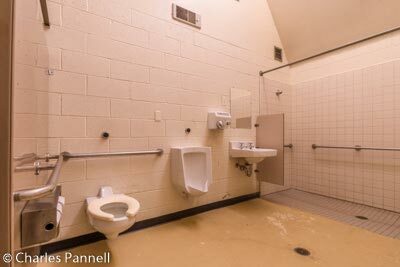 There is also a toilet with grab bars on the right and back walls (as seated), and a roll-under sink in the bathroom. 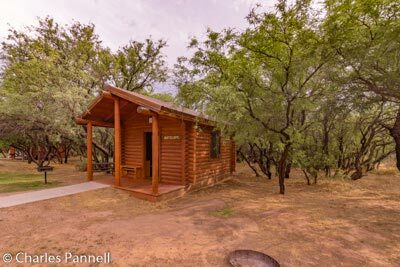 The cabins can be reserved at azstateparks.com/Parks/DEHO/ or by calling (520) 586-2283. Payment is required upon reservation. A $5 reservation fee is also added. In the end, no matter if you overnight or just stop by for the day, this often overlooked Arizona state park is a definite must-see. And since it’s not far off the interstate, it’s also a fun road trip stop.